Southern California // Big Crops, Big Money. "Evolution may have less to do with rising above one’s peers than learning to get along with more of them." The first #TeamHuman excerpt has been published on Medium! https://t.co/B3fA5JR7uo And yes: get the book! Guittard Chocolate Cookbook: Decadent Recipes from San Francisco’s Premium Bean-to-Bar Chocolate Company. 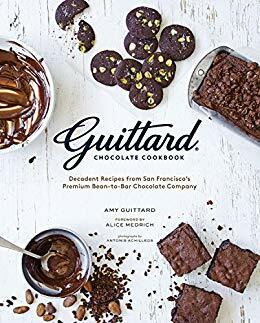 With 50 tempting photographs and 60 simple recipes for every kind of indulgence, Amy Guittard presents tried-and-true favorite recipes from five generations of Guittards, ranging from start-your-day-right Chocolate Cherry Scones to fudgey Mocha Cookies and deep, dark Chocolate Caramel Pecan Bundt Cake. Leave it to the people who really know chocolate to make a collection of recipes that are sure to make every chocolate lover long for one bite more. Thanks for the Mary Oliver poem link, that made my day. And that was, paws down, the best cat video ever.